Mopar #82209622 sport utility bars from Just for Jeeps are designed to mount to roof rack side rails on Jeep Compass model years 2007 through 2010. 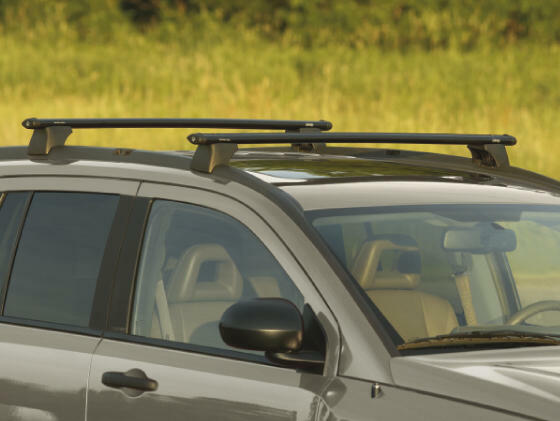 The T-slots on each end make it easy to attach your ski and snowboard carrier, kayak carrier, bike rack or other roof top sports equipment carrier to the sport utility bars. It's an inexpensive way to expand the carrier capacity of your Jeep Compass, and these sport utility bars are easy to install, too. You'll be ready for that next adventure to the beach, river, ski slope or bike trail. These are lockable sport utility bars with a usable carrying width of 42 inches using your Jeep Compass roof rack clamps to mount to production side rails on your Jeep. Also shop our Mopar item #82212352 Mopar roof rack cross bars, sold as a pair, for Jeep Compass model years 2011 through 2016. When it comes to Jeep Compass parts and accessories, you'll always find discounted prices on dozens of parts and accessories specifically designed for your model Jeep. From "Compass" logo license plate frames and sunshades to brake pads and brake light assemblies, we have the parts you need to repair or upgrade your Jeep Compass. We have removable rack cross bars for your roof rack and roof box cargo carriers. We have interior cargo space liners measured by digital laser to exactly contour to the floor of your Jeep Compass. Sign up for our free VIP email list to receive coupons and special sale notices by email during the year. Enjoy fast, low-cost shipping with every order from JustForJeeps.com. Black, mounts to production side rails, includes T-slots for carrier installation, lockable. Usable carrying width of 42"
The crossbars are exactly what I was looking for. They installed easily and shipped in a timely manner. After searching many places, I found your website. It was easy to find what I was looking for. The Description was excellent, the price was fair and the shipping was fast and secure. Excellent purchace for my 2009 Compass. Arrived quickly, well made, mounted easily with instructions. Aside from being useful, also adds a nice visual touch to my Jeep - looks great!